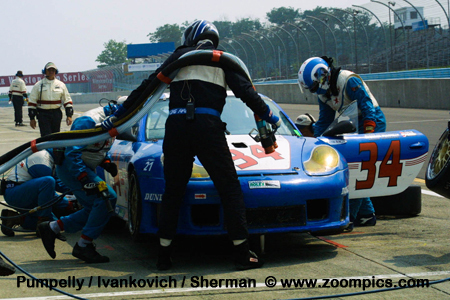 2002 was the Grand American Road Racing Championship (Grand Am) series’ third season. A business model which controlled costs had stable rules and avoided being dependent on automotive manufacturers attracted private teams. 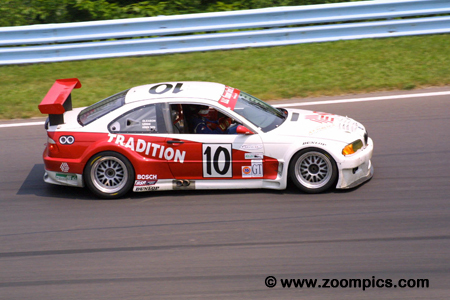 Based on the failure of the United States Road Racing Championship in 1999 critics suggested that the Grand Am would suffer a similar fate – races cancelled and the season cut short. However, that was not the case and all ten events were held as scheduled. Sports Racing Prototype I (SRP-I) - These are the purpose built two-seater prototype race cars. Competitors have a broad range of motor options to choose from – they include Ford, Chevrolet, Judd, Ferrari, BMW, Mazda and Porsche engines. Teams enter cars manufactured by Riley & Scott, Lola, Kudzu, Crawford, Reynard, Norma and Dallara. This season is the final appearance of the SRP-I category as it will be replaced by the new Daytona Prototype class in 2003. Sports Racing Prototype II (SRP-II) - Introduced in 2000, the SRP-II class is for cars which could use engines no larger than three liters. Similar to SRP-I, these are smaller purpose built two-seater prototype race cars with chassis’ constructed by Lola, Kudzu, Picchio and Pilbeam. Grand Touring Super (GTS) - This class includes production-based cars such as the Dodge Viper GTS-R, Chevrolet Corvette C5-R, Saleen S7-R and Porsche 911 Turbo. This category captured the overall victory at the 2000 (Dodge Viper GTS-R) and 2001(Chevrolet Corvette C5-R) Rolex 24. Grand Touring (GT) - This category is also for production based vehicles such as the BMW M3, Chevrolet Corvette, Ferrari 360GT and Porsche GT3RS. Turbocharged cars cannot compete in this class. 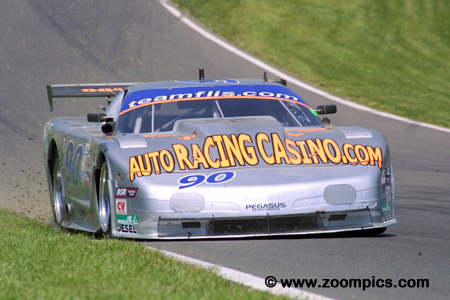 American Grand Touring (AGT) – American Grand Touring is for tube frame race vehicles. It includes cars such as the Chevrolet Corvette, Ford Mustang and Chevrolet Camaro. All vehicles are powered by a V8 engine which must not exceed a displacement of 375-cu.in.. The 2002 season consisted of ten races - beginning with the Rolex 24 at Daytona in February and ending in November at the same track. With some exceptions, the series visited many of the same venues as 2001. One of the changes saw Trois-Rivieres replaced with Mont-Tremblant. Also, Lime Rock was dropped in favour of California Speedway and the series completed at Virginia International Raceway instead of Road America. 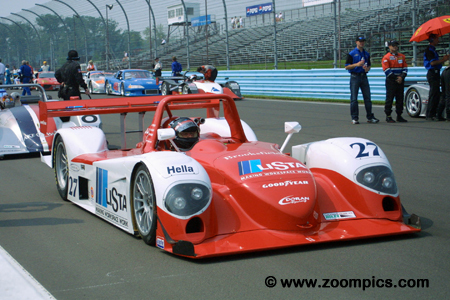 The Six Hours of the Glen was round five of the 2002 season and the first of two events held at Watkins Glen. The second race would be in August with NASCAR. Drivers would compete on the eleven-turn 3.40-mile road course for six hours. It is a Dyson Racing front row as the field of thirty-seven starters exit turn eleven and prepare to take the green flag. On the pole is the No. 20 Dyson Racing Riley & Scott MK III driven by Butch Leitzinger, Elliott Forbes-Robinson and team owner, Rob Dyson. This was the first pole position of the season for the No. 20 Riley & Scott. On the outside of the front row is the second Dyson entry shared by James Weaver and Chris Dyson. 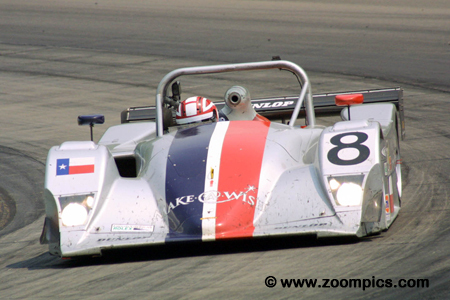 Dyson Racing entered two Ford-powered Riley & Scott MK IIIs. Both cars started on the front row with the No. 20 shared by Elliott Forbes-Robinson, Butch Leitzinger and team owner, Rob Dyson capturing the pole position. Leitzinger was the leader when he handed the car over to Dyson. Dyson’s stint did not last long as a power steering leak forced him to pit. Repairs were attempted but the car was retired. Qualifying second and sharing the front row with their Dyson Racing teammates was James Weaver and Chris Dyson. The pair trailed the pole-sitter early in the event but took the lead for good on lap-62 when the No. 20 Dyson car retired. They were not challenged for the remainder of the race and scored their second victory of the season – the first was in the previous round at Phoenix. 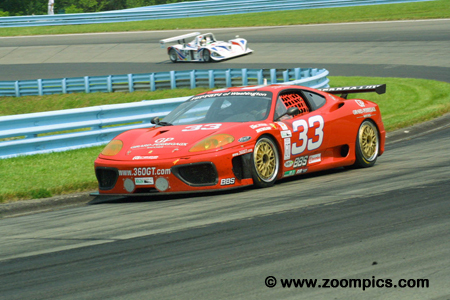 Entering Watkins Glen, the Ferrari of Washington Ferrari 360 Modena was third in the Grand Touring point standings. A lack of power prevented co-drivers – Bill Auberlen and Cort Wagner from challenging the quicker Porsches. But at Watkins Glen, the ‘stars aligned’ and the duo scored their first victory of the season in a dominating fashion – finishing four laps ahead of the second-place Grand Touring entry. The No. 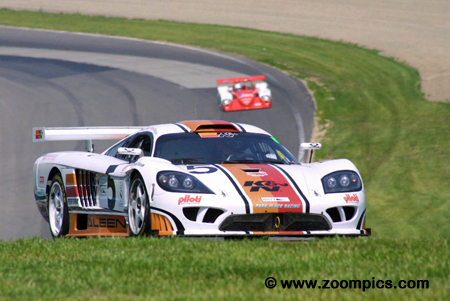 5 Park Place Racing Saleen S7-R appeared to be on track to defend their GTS title. In 2001, they won eight of ten races. This year they had taken three of the first four rounds. The Saleen was driven by Chris Bingham and Rodney Mall. The pair started ninth overall and first in GTS. However, an off-track excursion early in the race damaged the transmission – the car was retired after only six-eight laps. 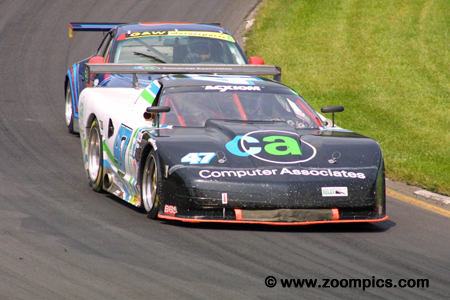 Morgan Dollar Motorsports entered two AGT class Chevrolet Corvettes. The quicker of the two cars was the No. 46 which retired early in the contest with a broken axle. The No. 47 Corvette was shared by the father-son duo of Charles and Rob Morgan. The pair took the top spot in the race when the category leader encountered engine problems. They held on for the AGT victory which put them at the top of the class standings. The retirement of the Saleen on lap-68 opened the door for the No. 14 GTS Porsche GT3R driven by Adam Merzon, Lynn Wilson and Tom Soriano. The trio led most of the race but in the final minutes of the event the bumper fell off the TRG entry and hit the GTS Porsche which damaged the windshield. 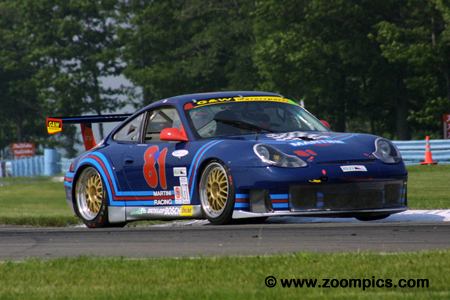 Merzon was behind the wheel and pitted which allowed the Jack Lewis Porsche to take the class lead and victory. Merzon returned and finished second. 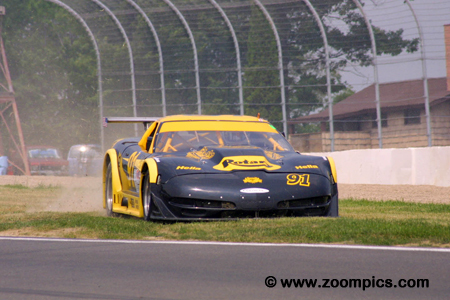 G&W Motorsports were the defending Grand Am GT champions but had not won a race in 2002. Their Porsche GT3R was driven by Darren Law and Brent Martini. The G&W entry started twelfth in class and thirtieth overall. Law and Martini moved up the race order but were never in a position to challenge the class winning Ferrari of Bill Auberlen and Cort Wagner. At the checkered flag, they were eighth overall and second in Grand Touring. The Miracle Motorsports driver line-up included John Macaluso, James Gue and the very quick, Buddy Rice. 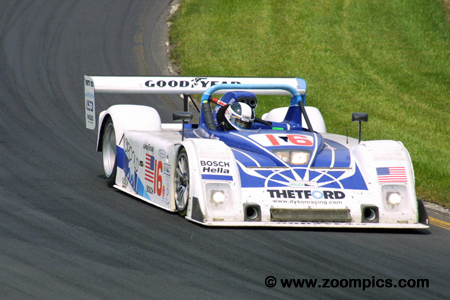 At Watkins Glen, Rice qualified the Riley & Scott MK III fourth. It was common for the team to start near the front of the grid but mechanical problems often prevented them from being competitive in the race. Despite multiple unscheduled pit-stops, the trio finished fifth overall and took the runner-up position in SRP-I. 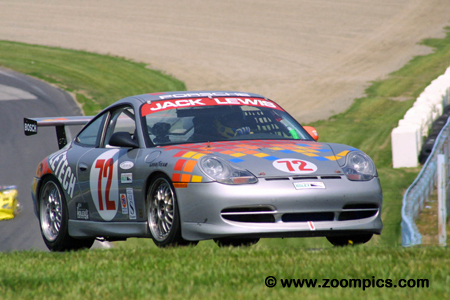 Making their first appearance in 2002 was the Jack Lewis Racing Porsche GT3 Cup driven by Lewis and Keith Fisher. The No. 72 Porsche was not as quick as the other cars in the GTS class – in fact they started thirty-third in the thirty-seven car field. The pair ran a consistent race and when the class leader encountered problems at the end of the contest, they were able to take the GTS victory. The No. 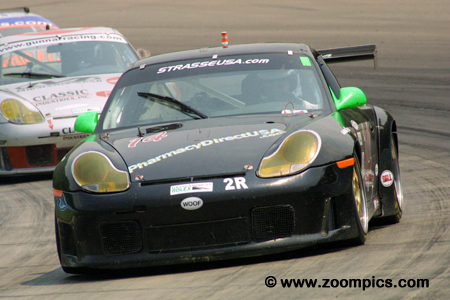 7 Rand Racing / Risi Competizione entry had scored victories in three of the first four events. 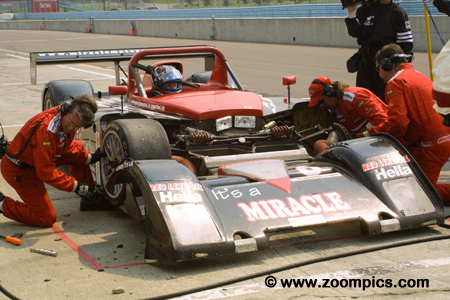 At Watkins Glen, the Nissan-powered Lola B2K/40 was driven by Nic Jonsson, Marino Franchitti and team principal, Bill Rand. The trio qualified sixth overall and second in SRP-II. During the event, they were no match for their teammates and finished three laps behind them – second in class and third overall. Doran Lista Racing won the opening round at Daytona and followed-up that performance with victories at Miami and California. 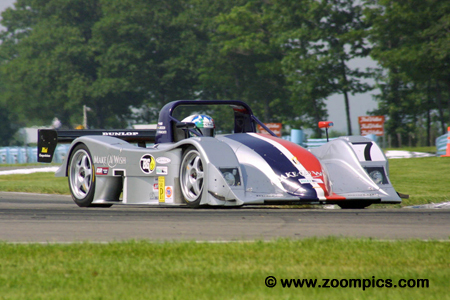 At Watkins Glen, the team fitted the Dallara with a new 5-liter Judd engine. The motor showed great potential and the team was pleased with the increased torque. Unfortunately, the car had to make a number of pit-stops due to an issue with the ignition coils. They started third but finished twenty-third overall. The No. 91 American Grand Touring Chevrolet Corvette was entered by Paladin Racing and driven by former World Challenge competitors: Mark Brannon, Steve Lisa and David Rosenblum. The Corvette was originally built by Leighton Reese and used in the Trans Am series. The team struggled with a number of issues but were able to keep the car on track and finished eighteenth overall and second in class. Heading into Watkins Glen the No. 90 Flis Racing Chevrolet Corvette was leading the American Grand Touring point standings. Sharing the Corvette for the six-hour event were Doug Goad, Jim Briody and Andrew Kopperl. 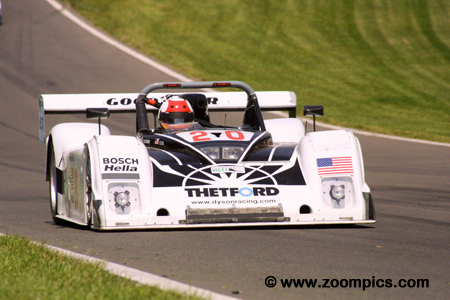 The car started third in class and fourteenth overall. Despite an accident in the final hour of the race they were able to salvage a third American Grand Touring but lost the points lead. The combined efforts of Rand Racing / Risi Competizione resulted in four SRP-II class wins in four starts. The sole victory for the No. 8 car came at California. Sharing the driving were Ralf Kelleners, Terry Borcheller and Anthony Lazzaro. At Watkins Glen, the trio was the quickest SRP-II car in qualifying and started fifth overall. After six hours of racing, they were second overall and first in their category. The last race for the No. 10 BMW M3 was the season-opening round at Daytona. At this event, the team finished seventeenth in Grand Touring. 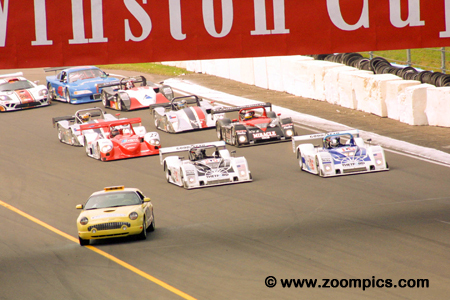 The Watkins Glen driver line-up included: Chris Gleason, Nick Longhi and Emil Assentato. The trio, started eighth in Grand Touring but at the conclusion of six hours, they captured the final spot on the class podium.